In this mesmerizing picture book from the author of the New York Times bestselling Stars, a young ballerina finds dancing inspiration in the natural world. 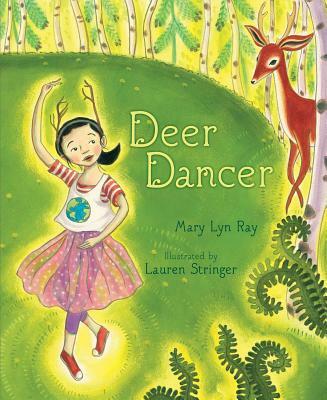 This gorgeous picture book from celebrated author Mary Lyn Ray features luminous and evocative art from Lauren Stringer and will capture the hearts of young dancers everywhere. * "A young ballerina finds her muse in a woodland creature. . . . Ray's brief text lyrically sings of the beauties of dance and nature. Stringer's lush acrylic paintings depict the forest in sumptuous shades of sunshine yellow and emerald green, the girl and deer each captured in swirling scenes of graceful movement. . . . How wonderful to connect the structured world of ballet with the free-form world of an animal at play. An ode to joyous dance." "Feeling a bit discouraged about her skills as a dancer, a little girl finds inspiration in a magical encounter with a deer in a peaceful clearing.... Stringer’s artwork is nothing short of mesmerizing. The shades of green saturating the book are rich and energizing.... Ray's spare writing is lovely and appropriate in its quietness, reflecting the hushed awe and respect of the little girl for her dance partner and their stage. This is a spectacular book, celebrating the outdoors, dance, and the beauty inside each of us." * "This utterly charming tale begins with a girl dancing in a glen. Then a deer appears. . . . Ray's evocative text has a subtle message about listening to the music in your heart. On the page, the words whirl in tandem with the marvelous art that recalls picture books from an earlier time. . . . Yet this beautifully crafted piece of bookmaking never feels dated, but rather timeless. Together, children and adults will revel in this excursion to a world where all is possible when no one is looking."